Good breads and pastries start with the best ingredients—high-quality flour, real milk, full-fat butter—and finish with time-proven methods and practices. We use a slow fermentation for our breads, resulting in better digestibility and more complex and nuanced flavors. Our Virginia Sourdough contains local flour to give it some Albemarle terroir. Our breads are bien cuit, giving them a nice robust crust. 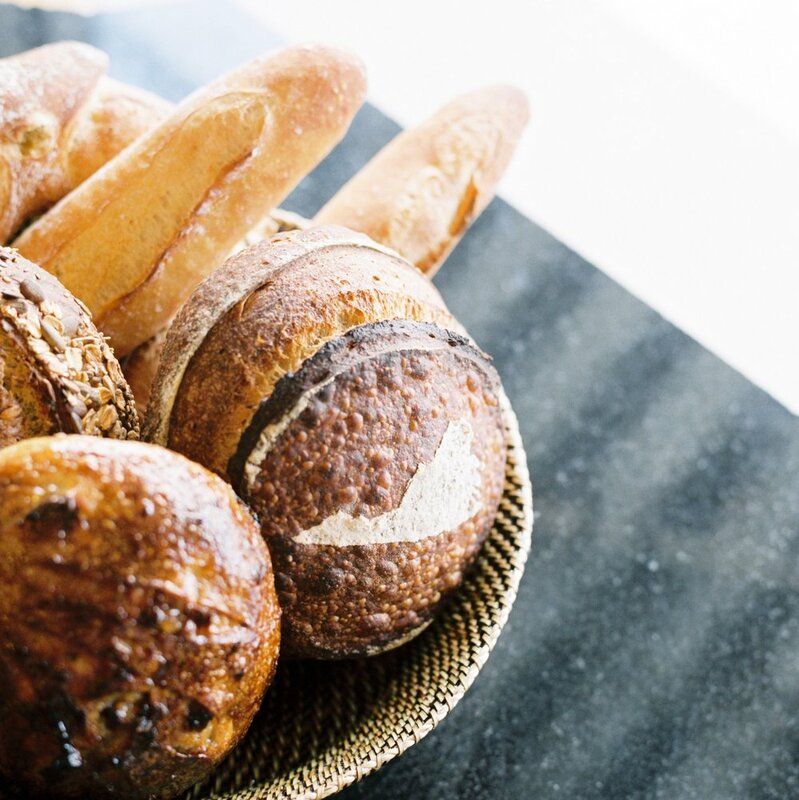 All our breads are baked fresh daily, as we believe picking up fresh bread should be a daily routine. Our selection of pastries are a mix of traditional viennoiserie and some of our own original creations. We take advantage of the wealth of farms around us and use local produce and dairy in many of our pastries. Simple. Honest. Ingredient-driven. We strive to create dishes where each ingredient is a star. We use local ingredients found in and around Albemarle County- from eggs and meats to produce and wheat. Our menu is designed to be approachable and unpretentious, yet memorable. MarieBette proudly serves La Colombe coffee. In addition to having outstanding coffee, La Colombe’s business principles are based on social and ecological responsibility. MarieBette Café & Bakery brings a unique experience to Charlottesville, in that we are both a bakery and a restaurant. In our café area you are invited to purchase breads, pastries, sandwiches & coffee -- to take home or enjoy in our casual café space. We also offer full breakfast, brunch & lunch menus available in our sit-down dining room. Petite MarieBette combines the bakery concept with a traditional coffeehouse. There we offer a warm space offering our pastries & breads, a variety of La Colombe coffees, and quick service salads & sandwiches. We believe that the local bakery is the heart of the community and are proud to provide Charlottesville with the most basic of human needs—good bread and a place to gather and connect. We draw culinary inspiration from around the world and right here in Central Virginia. MarieBette was conceived by Jason Becton & Patrick Evans, who first met at the International Culinary Center (formerly, the French Culinary Institute). MarieBette is named after their two daughters, Marian and Betty. Jason left his job as an art director in advertising to a pursue a culinary career at the Four Seasons Hotel New York. Jason’s interest in food and all things related was inspired by time spent in France. The use of seasonal ingredients and the simple-yet-beautiful presentations he was exposed to while in France helped to shape his culinary style. Patrick, a native son of Albemarle County, first found his inspiration where most cooks do—at home. Patrick grew up in a farmhouse in North Garden where family meals and fresh ingredients from the garden shaped his childhood. His culinary journey has taken him to New York, Spain, and now back home to Charlottesville. Growing up in California wine country with a chef for a mother and a farmer for a father, Will was taught early the importance of quality food and the value of time spent at the dinner table. Will moved to Charlottesville from California for new adventures and pulls culinary inspiration from the beauty of Central Virginia. Is it brioche? A croissant? A donut? Call it what you like; our brioche feuilletée is one-of-a-kind.